We depart Adelaide at 8.30am to reach Pick Swamp in the South East by around 2.30pm stopping along the way for coffee, lunch and any quick photo opportunities that present. At Pick Swamp we’ll find a wide range of waterfowl and other wetland species to photograph. There should be plenty of songbirds and perhaps a few raptors around too. If we’re lucky we may even crack it for good views of Australasian Bitterns which are regular at the swamp. Once the light is gone we’ll make our way 20 minutes up the road to the Victoria Hotel at Port MacDonnell which will be our accommodation for the night. Today we’ll leave the hotel bright and early to be on the registered charter boat by 6am (it leaves from just down the road). With around eight other passengers, we’ll cruise out to the Continental Shelf, about 25 kms offshore picking up species along the way before the real action starts. At the shelf we should encounter a large number of seabirds, including albatrosses, petrels and storm-petrels, shearwaters, jaegers and more. If we’re lucky we may even pick up some rarities as May is the ideal time to see some less common species. A barbecue lunch will be served on board before we make the journey back to port. We will arrive back at approximately 3.00pm. A debrief and coffee with the other passengers on the boat will precede the drive to the Naracoorte Hotel where we will eat dinner and stay for the night. Today we visit nearby Bool Lagoon, where a massive 182 species have been recorded. Along with the high numbers or waterbirds (including Brolga) and songbirds such as Southern Emu-wren, it's also a good place to photograph raptors such as Swamp Harrier, Wedge-tailed Eagle, Little Eagle, various Kites, Goshwaks and more. At around 11am we’ll depart Bool Lagoon and head back to Adelaide, stopping for lunch, coffee and any photo opportunities along the way. The price of the tour includes all transport, accommodation, pelagic fees, park fees, breakfast (Sun/Mon), lunch (Sunday only) and photography instruction/support from Craig. Dinners and lunches (except Sunday lunch), drinks, other personal expenses. Do you have sea legs? I have suffered from motion sickness in the past and found Travelcalm Blue (one the night before and one in the morning) works for me. If you don’t cope at all with being out at sea in light to medium swell, this trip may not be for you. That said, there are medications, as suggested, that may work and I suggest consulting a medical professional for advice on this. In the event the weather is such that the boat can’t safely operate, the trip may be cancelled. Usually this decision is made within 48-72 hours of the departure time. In the event cancellation is unavoidable, participants will receive a full refund. 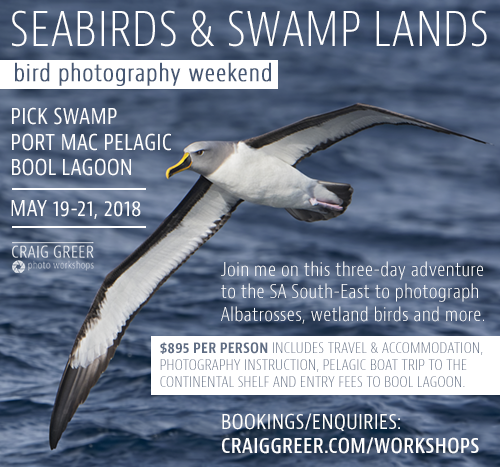 In the event the pelagic trip is cancelled once we have already departed Adelaide, we will arrange an alternative option (probably more time at Pick Swamp and/or Bool Lagoon) and a partial refund will be provided. To effectively participate in this workshop you will need a DSLR and or Superzoom (though DSLR is best for the pelagic part of the tour) and a lens with a minimum focal length of 300mm.